If you like that Minecraft to have a greater variety of animals, we introduce a mod, which deals precisely that. 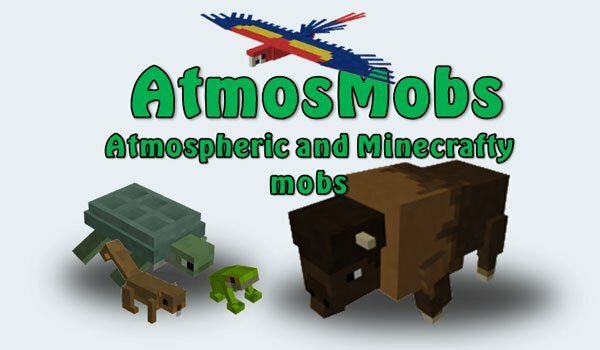 AtmosMobs 1.4.7 adds many new kinds of animals, from birds such as owls, gulls and eagles, to rabbits, frogs, crabs, bison, bees, deer, beavers, mantis, several marine animals, or others to the Nether as a salamander and a phoenix, among many others. In total this mod adds up to 42 new mobs, 6 hostile entities, 52 crafting objects, and new sounds to these animals, plus some Christmas surprises. Also is compatible with Extrabiomes XL Mod 1.4.7. How to install AtmosMobs Mod for Minecraft 1.4.7? Find out new mobs and much more in your Minecraft!